CloudHub is the Anypoint Platform which provides a fully-managed, multi-tenanted, globally available, secure and highly available cloud platform for integration and APIs as a service (iPaaS).It is managed via the Runtime Manager console. We can deploy our applications to CloudHub in various ways such as CloudHub API, CloudHub Command Line Interface,Maven pom, from Anypoint Studio or directly from CloudHub interface with a Mule deployable zip file via Runtime Management Console. In my blogpost last week, I shared how, in just 5 minutes, you can expose MySQL, DB2, SQLServer, Oracle or SAP datasource as an OData API into Salesforce using Anypoint Data Gateway for Lightning Connect. But let’s say what Data Gateway offers out-of-the-box is not a perfect fit for what you want to do. In the past you might have experienced the Command Line Cloudhub tools, and if so, you might have encountered many limitations regarding usability and options of commands. Now, a new version with improvements that will be appreciated for any user looking for a simplified usage of CH without losing any feedback nor visibility of their actions. This tool will be of good use for support and clients especially when needing to search quickly for answers regarding entitlements and information regarding organizations and environments. Data transformation is a core requirement for most integrations. Anypoint Platform provides multiple types of transformers, including XSLT, DataWeave and DataMapper. DataWeave, our new data query and transformation language, offers significant performance advantages over Anypoint DataMapper, our earlier data mapping and transformation solution. The below benchmark shows transformations performance using DataWeave and Anypoint DataMapper with payload size of 100KB (1000 records) with simple complexity. This post is the last in a three-part series covering the IoT projects that came out of our first internal hackathon of the year, and that we had on display at our first Integration of Things Zone at CONNECT 2015. Missed us there? Don’t fret, not only will you get a sense of the cool installations we built by reading the piece below, but we also share some of the code and tips that went into making them a reality. 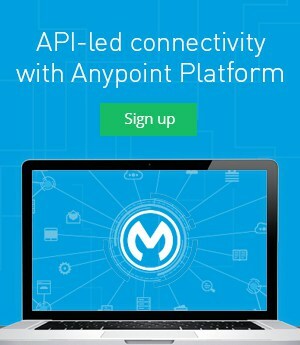 The latest release of Anypoint Platform includes major upgrades to our logging service for applications running on CloudHub (now a Platform service). With this release, users will be able to retain more log information per application, using a globally distributed infrastructure, and access the logs via an updated UI. Additionally, users who do hybrid management of on-premises servers and applications will now be able to set up High Availability (HA) for their on-prem servers using the new clustering feature.